...a good apple crisp recipe? I have been really craving a nice, warm bowl of this for quite some time now....especially since the weather is turning colder. I haven't had any since before my step-mother, Linda, passed away. 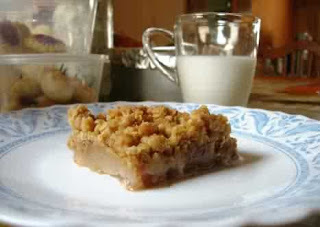 She couldn't make much (without burning it), but apple crisp (and fudge) was a different story. So, if you have a recipe for this (that's fairly simple...seeing as how I'm a first-time maker of this) that you wouldn't mind sharing, please let me know. I'll be eternally grateful!!! The kids are doing pretty well in school. They love it. Hannah is now able to count to 10 and say her ABC's up to G. This is NOvember 6th and they've only been going 3 days a week since October 1st, so I think that's a HUGE improvement on her part. Jacob is really trying. He is still talking with somewhat of a lisp when it comes to his "S" sounds (sissy is thithy). He's trying to count out loud when Hannah does, but he misses a number here or there, but even that is a major improvement for him. Dan's mother is worried that Jacob is going to feel inferior that Hannah is learning at a quicker pace than he is. I don't feel that way. I work with them both when they get home from school. I show no favortism towards one or the other. They both know that I love them as EQUALS!!! Dan is really liking his job. He's learning some new parts to it today, which he was pretty excited about. Me? I'm still in school and looking for work. I start my 5th term of college tomorrow. That's a good thing because I get bored when the kids are in school and I have nothing to do. You can only do so much housework or play so much Pogo, ya know? I have 3 more terms to complete and then I will have my Associate's. Time can NOT go fast enough.